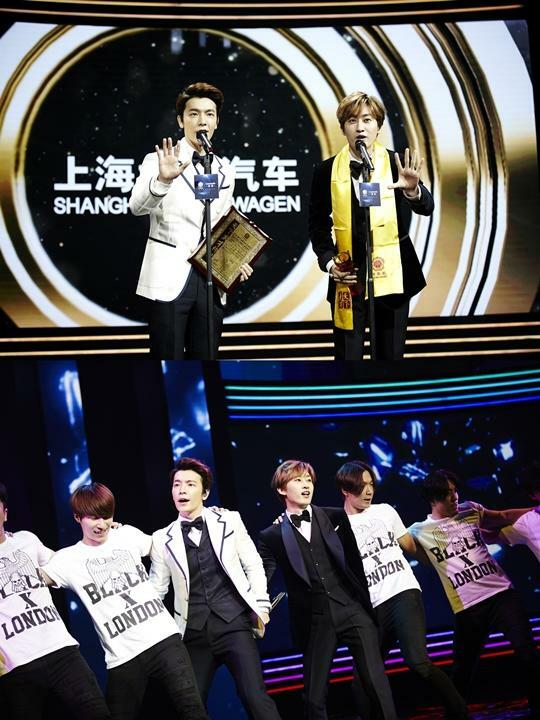 Super Junior received another award in China. On January 18th, 'The 15th Hwajung Celebrity Awards' was held at Venetian Hotel in Macau, and Super Junior garnered 'Global Best Group' award, and confirmed their huge popularity and influence once again. 'Hwajung Celebrity Awards' is an awards ceremony that was first launched in 2007, and celebrities from all over the world receive awards under many different categories. China's Council of State sponsors the event every year, and approximately 800 million netizens participate in online votes that take place prior to the awards. A great number of top celebrities from China and all over the world, including Chris Hemsworth, Naomi Watts, Donny Yen, Wang Li Hong, Yu Shi Man, and Lin Feng attended the event. Super Junior's Dong Hae and Eun Hyuk attended the event as two representatives of Super Junior, and they said, "It is a great honor to attend this event, and receive such an amazing award. We are going to share this joy with all of our teammates, and we would like to express a profound gratitude for all the love and supports that many fans have showed for us. We promise to keep doing our best to present much better music in the new year." Afterwards, they performed a few songs together. A great number of local medias, including Sina, Ai Qi Yi, TEN CENT, LeTV, TVBS, and PPTV spotlighted Dong Hae and Eun Hyuk's attendance, and many fans showed explosive reactions for their performance. Meanwhile, Super Junior are in the middle of their world tour at the moment.